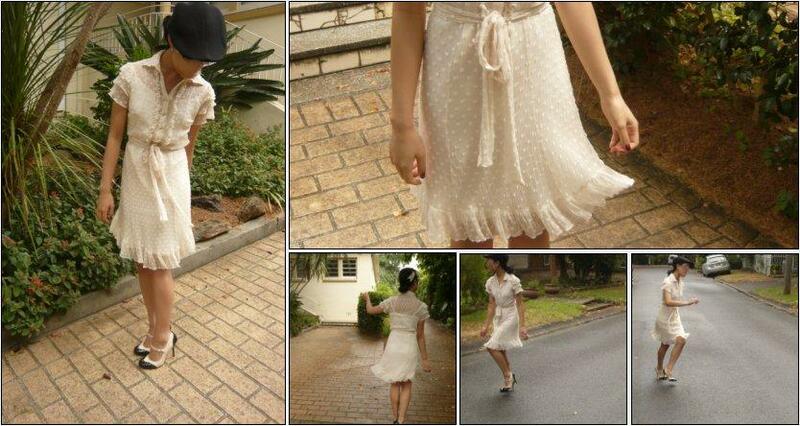 White frocks and frolicking. And angels. 11pm and I promised a post up today. Welcome to my idea of ‘making the deadline’. I used to be better at this. I’m sure I was. High school assignments finished before 10pm; undergrad assignments finished before 2am; Honours… erm. Started at 2am? Ah. I see. What a horrible development. So! Time to bash out a post before 1am. Let’s see, let’s see, let’s see. Did very little today. Met up with my thesis supervisor, scored a free book, and borrowed Doctor Who DVDs and Diana Wynne Jones books from the library. Entertainment for the week is definitely set! The hat is Valerie’s. I was only wearing it because we had just come out of the car and she doesn’t wear her hats when she’s driving. My shoes are wonderful and are from Wittner. Their purchase came around as a bit of an accident, really — I went in to get this pair of heeled brogues and then came out with something else entirely. I have yet to find the ideal pair of heeled brogues. I think they need to feel a bit more sleek. And with a lower vamp. One day! 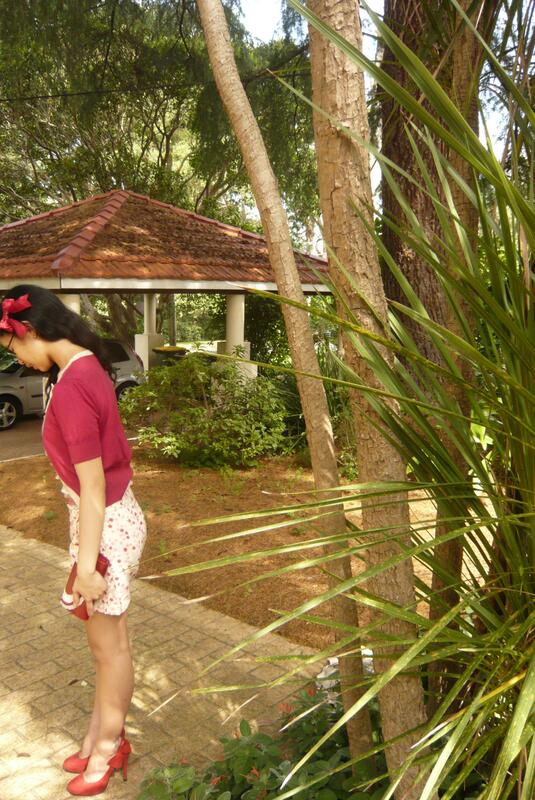 The bow was originally a brooch from Lovisa. I replaced the pin with an alligator hairclip and lo, instant hairclip or brooch. Nifty or what. My nails are sporting OPI’s All Lacquered Up, which is deep brown-based red. I think I might wear a taupe colour next time, just to let the champagnes and blacks bounce off each other differently. HOW IT FLUTTERS. IT MAKES ONE FROLIC, WHAT. They’re from Wittner and are my new favourite shoes, though they don’t work with everything I own. The white part is closer to a yellow-toned beige* than a flat white, so the contrast isn’t so stark. I’ll be wearing them on Thursday and will take outfit shots then! Till then, I’m giving you bits of Valerie. Who has incidentally begun taking notes on what I say, in case she can use them for… who knows what. For now, they will live on the bloggie XD. 10.57: ‘CARS LIKE ELECTRONS! ZOOMING AROUND ON… SILVER THINGS! YOU KNOW! IN COMPUTERS!’ -A. yelling in the car again. 11.15: Is bemused. Why is A. on the bed behind a wall of pillows? — Ah. Apparently, it’s a fort. 1.26: A. comes up from behind. 1.27: Screamed. Then A. screamed. Why. 1.28: V. thinks that her brother can probably hear their terrified screams from the living room. 3.15: Watching Doctor Who. FORTY-TWO MINUTES TO SAVE THE SHIP, SAVE THE CREW, RETRIEVE THE TARDIS, RESCUE MARTHA (AND THEN THE DOCTOR), AND STOP THE CREEPY SUN-MEN ZOMBIES. Head will explode from excitement. Ah, uni life. Play hard, (avoid) study harder. 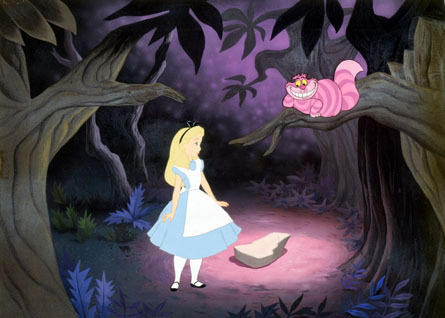 I’m a big Alice in Wonderland fan. I found the text funny and whimsical, and the Disney film wasn’t too bad, either. I think she’s rather strange for it, but apparently she’s not the only one. 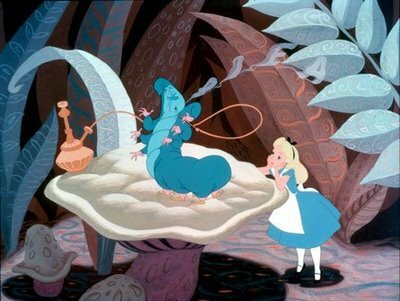 I hope you don’t agree with her because every time someone agrees with her, I’m faced with ‘I TOLD YOU SO!’ I’ve tried to tip the scales in my favour, which is why I’ve polluted this post with multiple whimsical Alice-themed pictures. Not Alice-themed, but I haven’t shared an outfit in eons and the guilt is consuming me. You’ve no idea. I’ve a litany of excuses but you don’t want to hear them, so…! Picture time! Only one photo, though, because it’s been far too hot to prance around outside. Apologies for my tendency to wander out of frame. 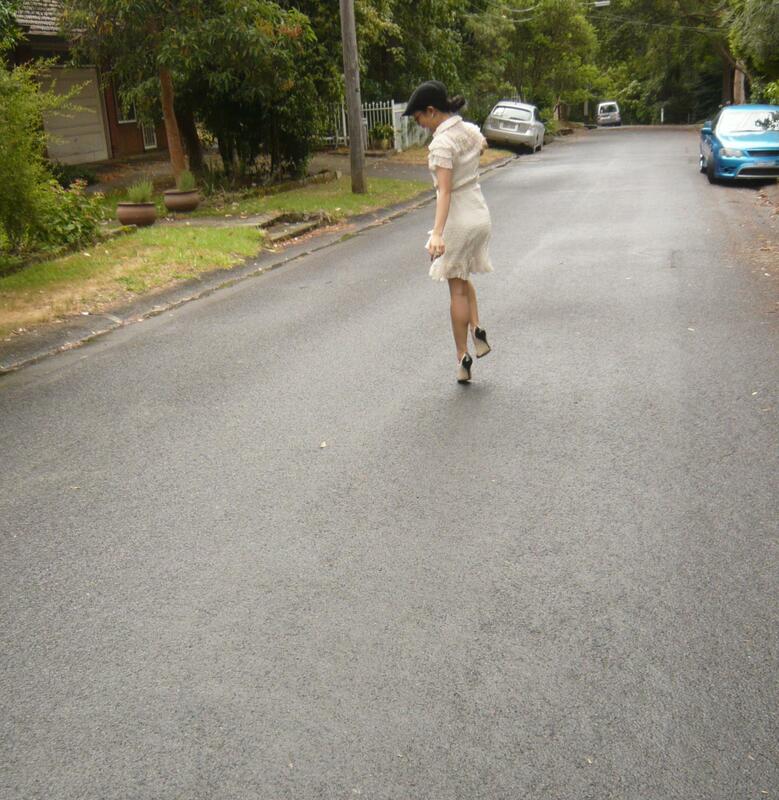 I don’t think I have the ability to sit still when Valerie takes photos. In this photo, I’m wearing the usual suspects: a cherry Puff the Magic Dragon cardigan, a pink Adorable Wafer Girl cami, and the red heels with their little DIY bow. I need to replace those heels, actually, so if anyone sees a pair of red suede heels (4″, with or without platform) with a rounded toe, give me a shout. The shorts, which I haven’t posted before, are the Gorgeous Geisha shorts from Spring/Summer 07. They’re actually my only pair of shorts, and I use them quite often in summer, so I should really get more. 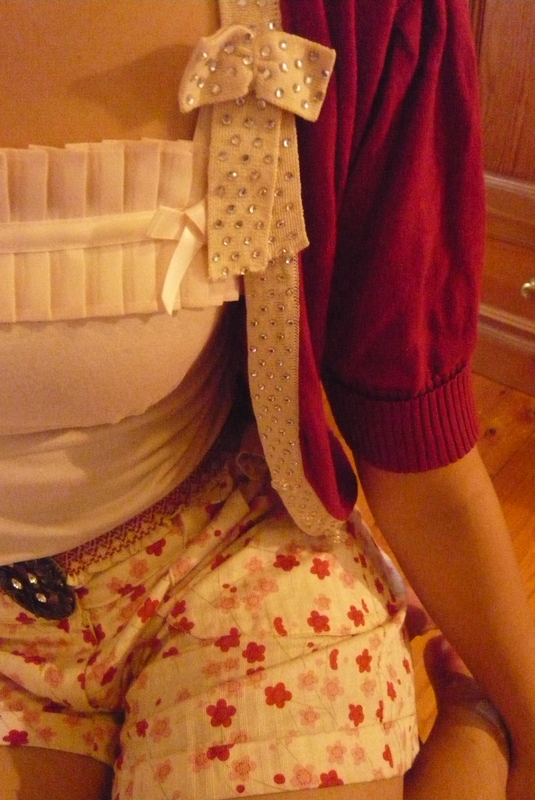 I wore this outfit on my birthday (quite a while ago now! ), when Valerie and I went to Newtown for breakfast, wandering and visits to Enmore’s Cow and Moon artisan gelato and general deliciousness place. It was hot but the gelato was amazing. Try the panna cotta flavour. And the papaya one. And the lime. It tastes like… lime. It actually does. I can’t describe how amazingly freshly lime it tastes. Dear god. And their baked ricotta cheesecake is the only cheesecake I’m happy to eat. Oh, I really want cheesecake now. AAAUGH. THE CRAVINGS. And all I have is a bottle of freshly squeezed watermelon juice, which, while all levels of awesome, isn’t ricotta cheesecake. How sad. 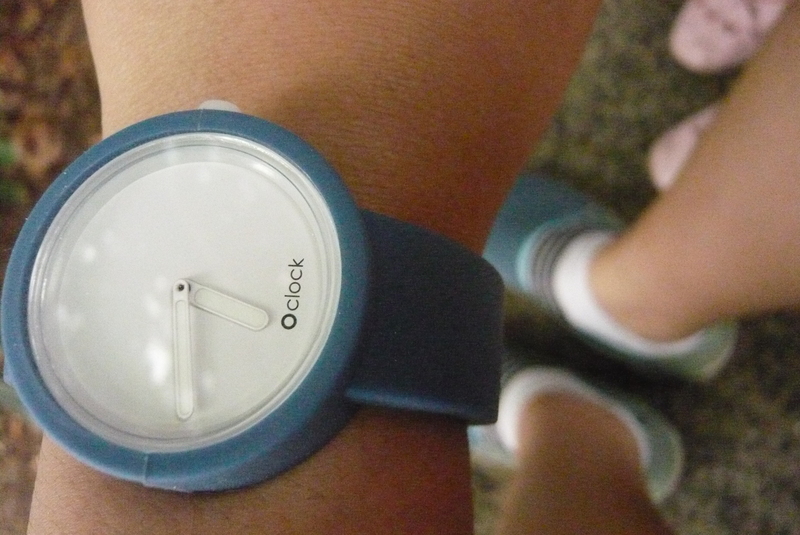 Valerie also bought herself this fun watch with an interchangeable silicon strap. You’ll find them at Monster Threads. Fun shop. Good shop. Go look. I have no Newtown spoils to share, but I will leave you with another shot and another story. On my birthday, I walked into the kitchen to find Valerie acting rather suspicious. ‘DON’T LOOK!’ said she, and I complied. I closed my eyes, backed out of the kitchen and promptly collided with the piano in the living room — and the piano is a solid wood 19th century monster of an instrument, by the by, so the collision was painful. 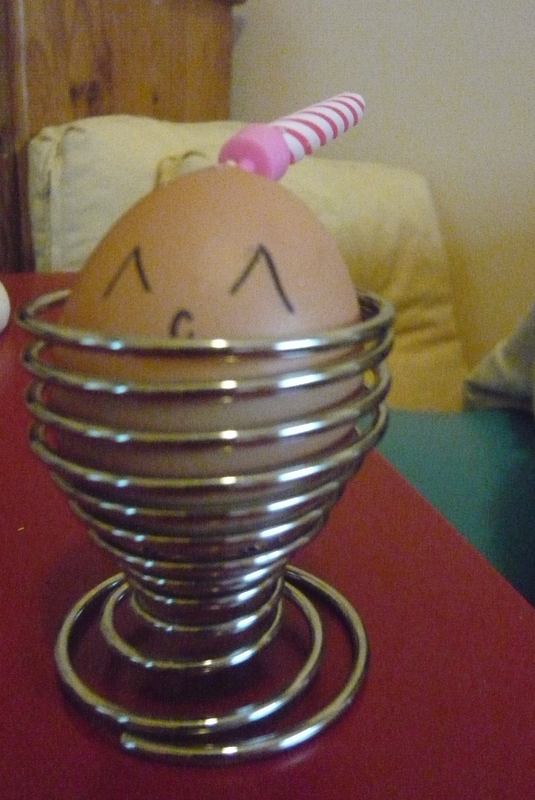 ‘Tis a happy egg, inspired by Valerie’s favourite internet song, and the one internet song that baffles me more than anything else: ‘I Love Egg‘. It has… well. Eggs. Dancing. And. Turning into things. And. It’s really just very baffling. And the fact that I find it absurd?